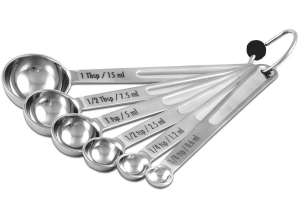 A measuring spoon is a spoon used to measure an amount of an ingredient, either liquid or dry, when cooking. Measuring spoons may be made of plastic, metal, and other materials. They are available in many sizes, including teaspoon and tablespoon. In the U.S., a measuring spoon is number of pieces, especially four or six. This usually includes ¼, ½, and 1 teaspoons and 1 tablespoon.